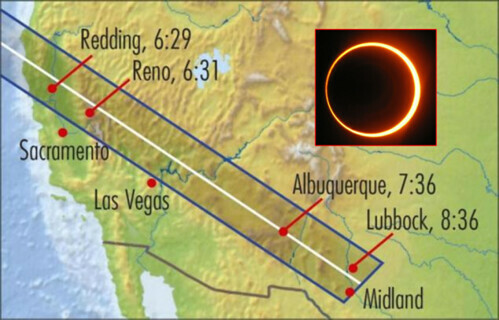 We went to see the annular solar eclipse that was going to pass over northern California, Nevada, and Arizona on May 20th. The eclipse happens when the moon passes between the earth and the sun, leaving a huge shadow that is cast over parts of the earth. The shadow moves really fast, about 1,250 mph! Because the moon didn't block out the sun completely, it didn't get dark outside during the eclipse, but it did block out 94% of the sun light. We wanted to drive to the nearest place where we could see the moon pass totally across the center of the sun, making a ring. This was only possible in a 'small' band, along the center of the path of the shadow. Unfortunately (or maybe fortunately? ), that meant we had to drive up north a little. We decided to go towards Chico, which was supposed to be pretty much directly in the center of the path. 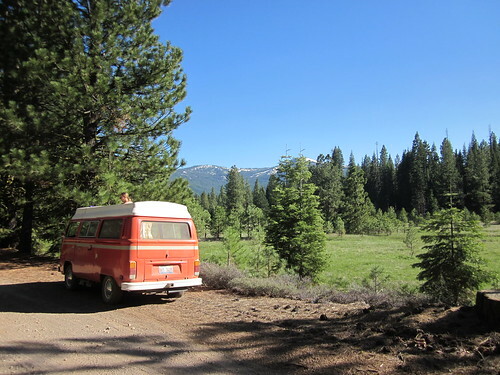 However, because we didn't want to stay in the city (we wanted to camp afterwards), we headed up into the Sierra Nevada mountains just outside of Chico. 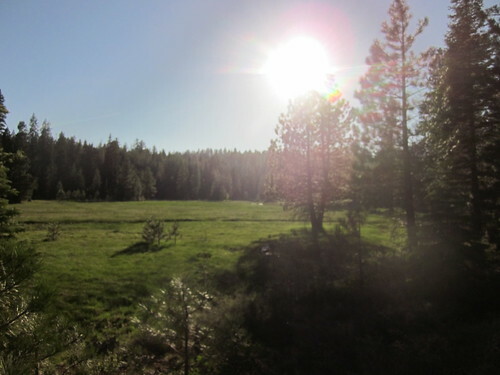 Our solar eclipse viewing spot in the Sierra Nevadas. We were driving the bus to go see the eclipse, so we were a little slow. We got to Chico just about an hour before the moon was predicted to start passing in front of the sun, which was about 5:15pm. We figured that we better try and get as high into the mountains with that hour we had. It was like we were racing the sun and the moon! I am happy to say that the VW bus won! We got to the crest of the Sierras (literally, we were just west of the Pacific Rim Trail) near Chester, CA when we found a nice forest road off of the highway. Watching the eclipse with Romy's welding helmet. We took the forest road a way before we got to a nice small meadow. It provided a perfect clearing where the sun was in full view. So we parked the bus and got set up. We pulled out Romy's welding helmet, which turned out to be perfect for viewing the eclipse. It was auto darkening, so as soon as you put it up to the sun, it darkened up. We figured out that waving your hand in front of the light sensor helped keep it dark. The sun looked greenish through the helmet. Then once we were sure the helmet was working, we pulled out some ice cold beer, and the dinner we packed for ourselves. Our attempt at taking a picture through the welding helmet as the moon was just passing the sun. Like predicted, the sun got a small dark spot in the lower right at around 5:15pm. The dark spot got bigger and bigger, and traveled diagonally up and left over the sun. The dark spot was the moon! It took until 6:30pm or so for the moon to get completely over the sun, but since it didn't cover it completely, it left a glowing ring! It looked so cool! 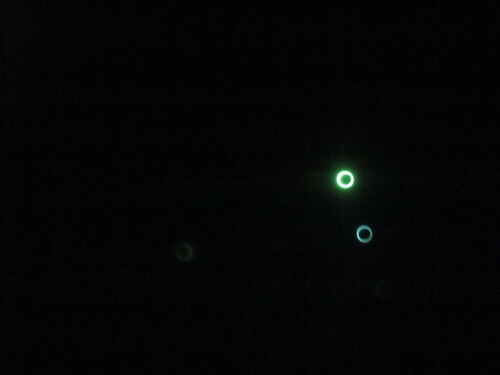 We tried to get a picture of the eclipse when it was full on through the welding helmet. It didn't turn out as nice as other ones I saw later on, but I'm glad we got something! It was so exciting watching the moon come over the sun so slowly. As the moon started to cover more and more of the sun, it began to get kind of dim outside. It also got noticeably colder. I had to put my sweater on, even though before the eclipse started, I was in a shorts and t-shirt. It wasn't a total blackout during the eclipse, but it did get a little dimmer and cooler outside. We were in a pine forest, so there weren't really any shadows cast on the ground. But after we got back, some of our friends who also saw the eclipse in Chico saw crescent moons in the shadows of deciduous trees. Each leaf that slightly overlapped another leaf and was able to make a pin hole projected the eclipse onto the ground. That would've been pretty cool to see, but we didn't notice any shadows like that. We really enjoyed being able to see the eclipse. I am so happy that it passed over California! 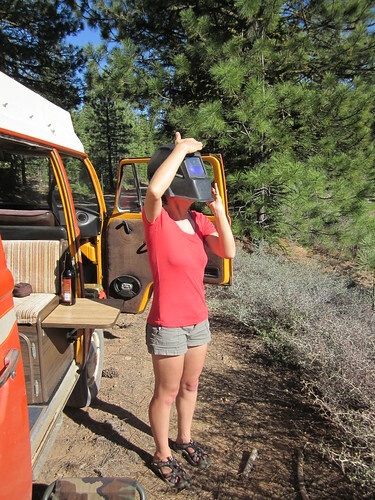 Nicole and Marcel also saw the eclipse, but they went to Pyramid Lake in Nevada, and said that they also thought it was really cool to see (also through a welding helmet)!